Propane is the wise choice for home and business owners in the Phoenix metropolitan area. It is clean burning and easy to control the amount of heat you need making propane the perfect choice for any gas fired appliances or machinery. Fire Features – Everyone loves the heat and dancing flames that a fireplace, fir pit or tiki torch provides. You can make a dramatic and visually appealing addition to your home or business with a fire feature from Propane Services. And, we can deliver propane to your home to keep your fire feature burning all winter long! 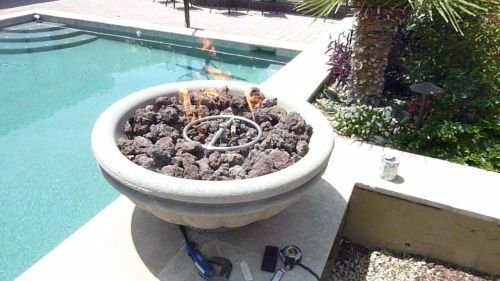 Learn more about how we can help beautify your Phoenix metropolitan home or business at Fire Features. Pools and Spas – Keep the pool and spa at your home or business warm for year round enjoyment with propane. We at Propane Services are experts at installing tanks and gas lines to pool and spa heaters. Propane is economical and will efficiently keep the water in your pool or spa nice and comfortable. Learn more about the services that we can provide you with at Pools and Spas. Hot Water and Heating – Every home and business throughout the Phoenix metropolitan area needs reliable hot water and heat during the chilly winter months. Let the professionals at Propane Services install a tank and gas line to efficiently provide you with hot water and heating. Also, learn about installing a tankless water heater which is more efficient and allows you to have instant hot water. You can learn more about this service at Hot Water and Heating.